Our wonderful menu adds to the historic feel of our cruise. 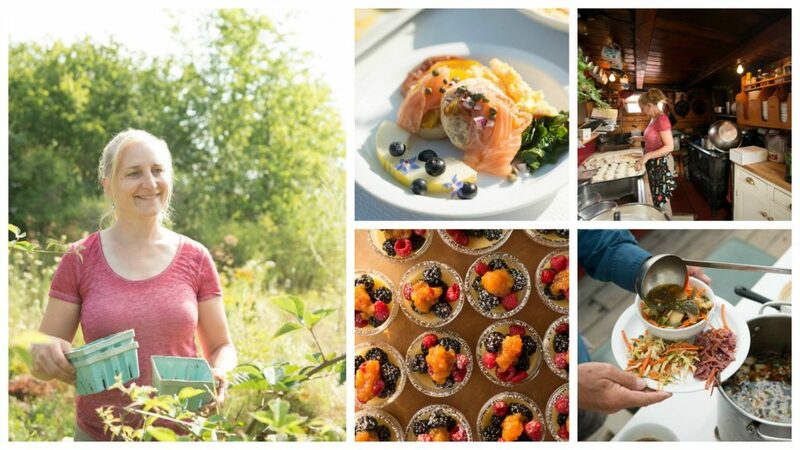 Much of what nourishes us all week comes from local farms and Annie’s ever expanding garden. The eggs come from her chickens, the meat from down the road, and the cheese from the top, award-winning cheese-makers in the state. To begin with, the highest quality and freshest of ingredients allows for simple yet elegant meals that are both healthy and charming. Each morning, as you lay snug in your berth, Annie is up stoking the fire of her Cottage Crawford wood stove as she churns out the day’s pies and breads, such as caramelized onion bread, Irish soda bread or whole wheat and walnut bread. As you wake to the rich smell of freshly brewed coffee, roasted locally, Annie is cooking a delightful breakfast feast – whether it’s fresh baked muffins, boiled eggs, homemade granola, yogurt and dried fruit, or Maine blueberry pancakes, slab bacon and sliced melon. 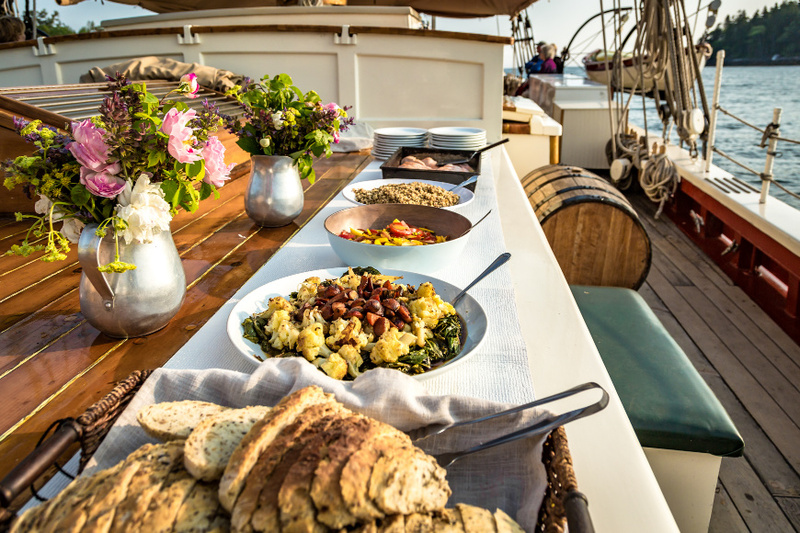 Lunch, often served on deck amid the sea air and rugged scenery, is usually a hot soup or stew such as curried lamb and lentil stew served with a spinach salad and an almond-honey dressing – and maybe one of the breads and desserts that came out of the oven earlier in the day. One fine afternoon each week, we pick out just the right deserted island beach and prepare an authentic lobster bake with all the trimmings – including extra lobsters for those who somehow manage to have room left over! 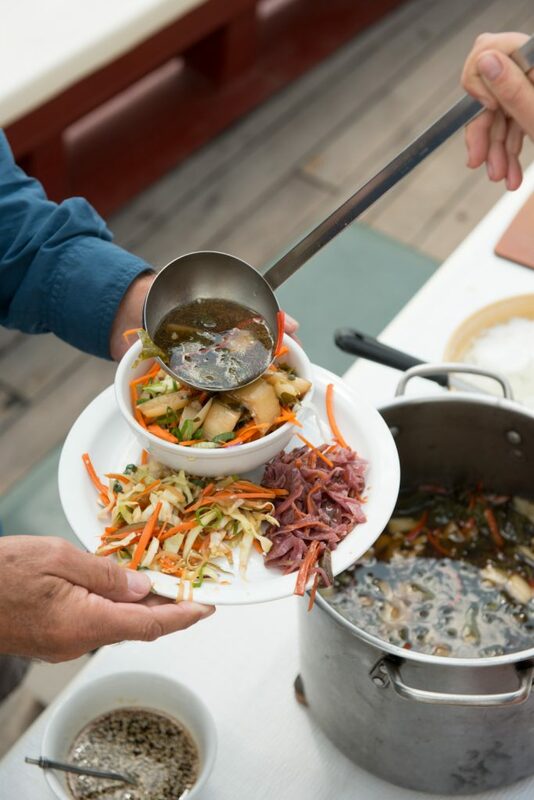 In the evening, dinners created with care and creativity are served down below in the galley, made cozy by the lighting of kerosene lanterns and fresh flowers on the table, where the day is remembered well and tomorrow is anticipated with eagerness. Because Annie uses the freshest of ingredients, there is not a set menu. Meals for your trip are based on what is coming out of her garden, the local farmer’s markets, and being delivered by the CSA share. A sample menu might include: Maine Blueberry Pancakes, Butcher’s Cut Bacon, assorted Melon Wedges, and Fresh Juice for breakfast; a lunch of Clam, Salmon, Haddock, or Seafood Chowder, Lemon and Chive Biscuits, Garbanzo Bean and Roasted Eggplant Salad, pickles, oyster crackers, and Almond Poppy Seed Cake; a pre-dinner appetizer of Roasted Red Pepper and Artichoke dip with tortilla chips; ending with a dinner of Poached Salmon w/ Tri-pepper Salsa, basmati rice, green peas w/mushrooms, whole wheat walnut bread, and Strawberry Shortcake. For over 25 years, Annie has honed her craft with both knife and pen. Her first cookbook, At Home, At Sea was highlighted on the Today Show and her food featured in dozens of national media outlets including the Food Network and Traditional Home Magazine. In the winter she continues to create new recipes and shares them in her food column The Maine Ingredient for the Portland Press Herald. You can read more of Annie’s writing on her recipe and lifestyle blog – At Home & At Sea. She has just released her third cookbook Sugar & Salt: A Year At Home and At Sea this summer. Copyright © 2018 Schooner J. & E. Riggin. All rights reserved.